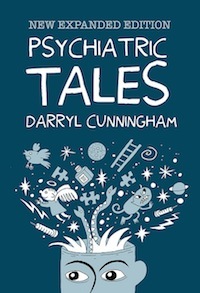 I really enjoyed Darryl Cunningham’s Psychiatric Tales when it came out a couple of years ago. (His later book, How to Fake a Moon Landing: Exposing the Myths of Science Denial, was released in the US this past spring.) It was originally released in the UK before being reprinted in the US. Now, the paperback edition is out in the UK with 40 new pages, which is made up of two new chapters and new chapter headings. Cunningham explains the decision at the Forbidden Planet blog. I’m not sure I want to re-buy the book for the extra material — although I really like Cunningham’s work, so I’m considering it. You can get it from Forbidden Planet directly, although I’m not at all sure that they ship outside the UK, or from the publisher, Blank Slate Books, or from third-party sellers on Amazon.com. Cunningham’s next new book will be a comic book exploration of the 2008 economic crash and following financial crisis. He’s posted some sample pages.